Joe Scarborough and Mika Brzezinski reached their biggest audience ever when they talked Friday about President Donald Trump's tweets about their show. The Nielsen company said Wednesday that 1.66 million people watched the MSNBC morning show the day after the tweets. That narrowly beat the show's previous record, which came the day after Trump was elected last year. Trump, in denouncing the show last week, wrote that Brzezinski was "bleeding badly from a facelift" when he saw them around the New Year. Friday's "Morning Joe" proved more popular than Trump's favorite morning show, "Fox & Friends." 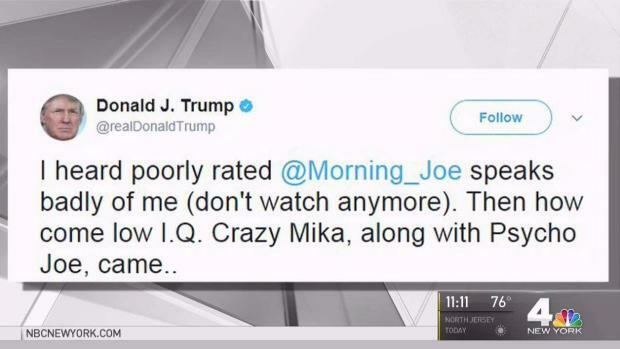 Even Trump tweeted that he watched "Morning Joe" on Friday. So far this year, "Morning Joe" is averaging 896,000 viewers, typically running second behind Fox News Channel's morning show. Scarborough and Brzezinski delayed a holiday vacation to address Trump's tweets on Friday.